A very long sleep deprived day for me in Tokyo - landed at Haneda at 7am, then headed to Shinjuku for coffee and an early lunch while waiting for my hotel room to become available. 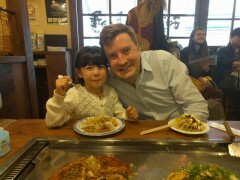 When it was, I perhaps foolishly eschewed my usual post flight afternoon nap and instead powered through, meeting up with Andrew who was in on Japan a business trip to give him a bit of a guided tour of Tokyo. We started in Akihabara, then headed onto Asakusa, after which Andrew headed back to his hotel and I just about managed a visit to Quercus in Ikebukuro to see Watanabe-san before returning exhausted to Shinjuku to collapse at my hotel. 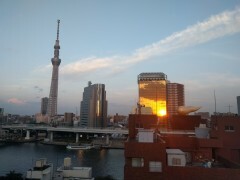 Following yesterday's marathon a thankfully much quieter day in Tokyo. After sleeping surprisingly normal hours for local time I lazed about in my hotel room in the morning, and then for lunch went to "Ain Soph Ripple", which was conveniently nearby, for a surprisingly good veggie burger. 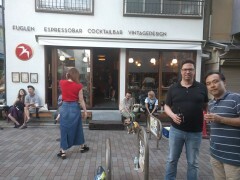 Wandered around Shibuya for a bit after that, then met up with Tanaka-san for a drink at our old Shibuya Stalwart Ningen Kankai, then headed on to try hipster outpost Fuglen where Andrew joined us. From there we went to a random back street yakitori place and rounded off the evening at conveyer belt sushi place Uobei. The first night's sleep pattern was obviously two good to be true, and on my second night I think I only managed about three hours sleep. Ho, hum. 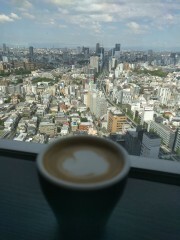 Spent the day working at my office in Tokyo but was struggling to stay awake. 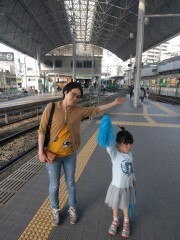 Left early to get a shinkansen to Hiroshima so I could be there in time for Erika's bedtime. 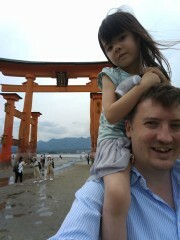 Chie was busy with her Dad at the hospital for the day, so I took Erika to Miyajima to visit the aquarium. Spent the afternoon in the centre of Hiroshima, had okonomiyaki at Nagata-ya for lunch, then some popping candy ice cream for dessert later on. I worked in the daytime while everyone else went out for the day. 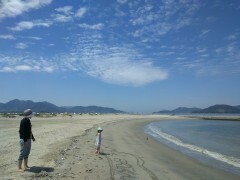 Went to visit Chie's aunt Chikako-san in Nishi-Hiroshima in the evening. Went for a quick visit to a beach in the morning, followed by a visit to Kure for lunch and to see the Irifuneyama Western style house there. Shopping at Aeon Mall toward the end of the afternoon then Kura Sushi for dinner. Had lunch with a friend of Chie's in Hiroshima before getting the shinkansen to Fukuoka, where we'd be staying the night ahead of our flight back to the UK the next day. 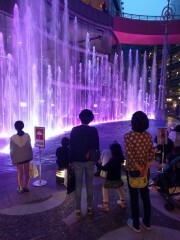 Dinner with another friend of Chie's in Fukuoka in the evening where we also enjoyed the water fountain, lights and and projection shows in Canal City. Flew back to London today, Chie had booked with FinnAir which meant a change at Helsinki. 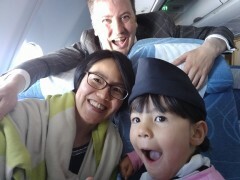 The cabin crew on the Fukuoka to Helsinki flight were rather lovely, and made a big fuss of Erika, giving her a hat and scarf and letting her help give out the food and drink etc.